Brown Davis aluminium drop tanks and foam filled alloy fuel cell/tanks have become the favoured choice of motorsport vehicle builders and enthusiast’s nation wide. Using the highest grade materials, each tank is laden with quality and fabrication excellence. The current range of alloy drop tanks offered are listed below, however Brown Davis have also been fabricating custom race fuel cells and tank set ups for over 30 years, and can produce tanks to suit specific needs and requirements on an individual basis. Widely regarded as the best aftermarket alloy drop tank available, the specific Brown Davis Holden Torana drop tank has become the bench mark in quality and performance. Based on the original design as used by Holden Racing Team during the Torana’s touring car days. The standard offering is a 120ltr tank, which is a bolt in item to suit the standard floor pan with no use of mounting straps, whilst the standard fuel gauge sender and fuel pick ups are retained. 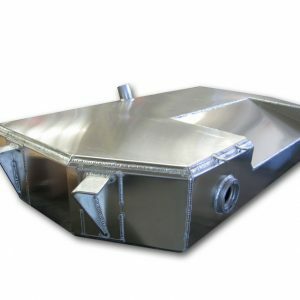 The alloy drop tank incorporate several important features as standard, including 45deg edges for high strength and reducing stress on weld seams, double skinned mounting bracket supports giving rigid mounting strength and again aiding to prevent fatigue damage, machined fuel sender gauge boss, and internal fuel baffles.